GIGABYTE Z68 series motherboards provide all the advanced overclocking features users have come to know and love about the GIGABYTE P67 series motherboards including increasing processor core ratios, increasing DDR3 memory ratios and increasing power and current limits. In addition, GIGABYTE Z68 motherboards also allow users to increase the graphics core clock speed, for even greater graphics performance. Intel Smart Response Technology Gigabyte Z68 series motherboards are equipped with the much anticipated Intel Smart Response technology allowing you to experience performance similar to SSD-only systems. Intel Smart Response technology works by using intelligent block-based caching of frequently used applications to improve system performance and responsiveness. In fact, Gigabyte Z68 motherboards with Intel Smart Response technology are able to outperform hybrid system by more than 2x (PC Mark Vantage HDD Test) and HDD-only system by as much as 4x (PC Mark Vantage HDD Test) and deliver 60% performance improvement over HDD-only system in PC Mark Vantage Suite. GIGABYTE EZ Smart Response The GIGABYTE EZ Smart Response utility is a convenient application that allows users to quickly and easily configure their system for Intel Smart Response technology. In the past, enabling Intel Smart Response technology meant users needed to enter BIOS in order to configure their system for RAID mode, which then required a complete reinstall of the operating system. Once that processes was completed, users then needed to install the Intel Rapid Storage Utility as well as configure Intel's Smart Response Technology. GIGABYTE EZ Smart Response does all of this automatically, without users having to perform a complicated install process. This allows them to quickly and effortless enjoy a significant boost in system performance. GIGABYTE Touch BIOS Navigating through the BIOS to change system settings can a daunting task for users not familiar with control "F" functions and mouse-less navigation. While some EFI BIOS try to address this with a mouse friendly environment, many implementations still lack certain ease-of-use necessary for most people. With GIGABYTE Touch BIOS, GIGABYTE engineers have completely re-imagined how users interact with their BIOS, allowing for a more intuitive user experience. In fact, with a touch screen monitor, GIGABYTE Touch BIOS is as easy to use as most apps on you iPhone. 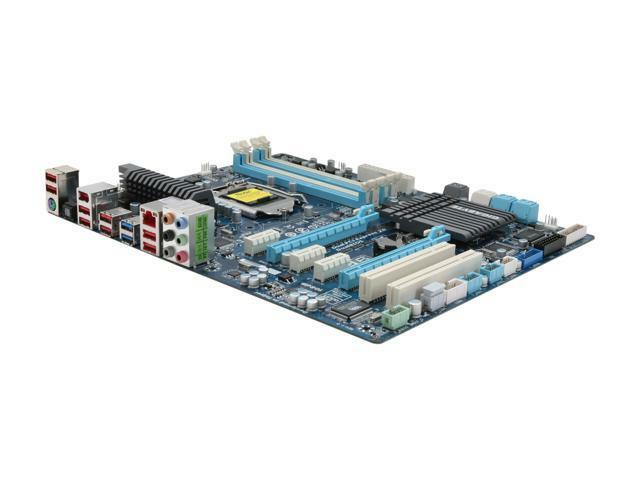 Switchable Graphics with LucidLogix Virtu GPU Virtualization GIGABYTE Z68 motherboards are enabled with LucidLogix Virtu GPU Virtualization technology which allows users to dynamically switch between their built-in graphics and their high-end, 3D discrete graphics cards. This is ideal for gamers who require high-resolution gaming and still want to enjoy the built-in media features of 2nd generation Intel Core processors. In so doing, switchable graphics helps to dramatically reduce PC graphics power consumption. USB 3.0 & SATA III & 3x USB Power Boost The SuperSpeed USB 3.0 technology provides blazing fast data transfer speed of up to 5Gbps between your USB peripherals and system. SATA III technology offers up to 6Gbps link speeds for twice the data transfer rates of SATA Revision 2.0 (3 Gbps). 3x USB power boost delivers greater compatibility and extra power for USB devices by efficiently regulating output over the full voltage range. Multi-GPU support with CrossFireX and SLI Flexible graphics capabilities supported for either CrossFireX or SLI action, delivering the ultimate in graphics performance for gaming enthusiasts who demand the highest frame rates without compromising on resolution. Other Thoughts: I had this for 5 years, worked fairly well, maybe the bios is a little confusing but it worked. Tried overclocking for the first time, and the bios just gives up. I get stuck in a boot loop, can't get into the bios. Tried resetting everything, tried restoring backup bios, nothing. Got a new mobo online and everything works fine. This was a time bomb mother board and I got unlucky with warranty. Pros: Fine when it will actually let things pin up and boot. Sadly that becomes rarer over time. Cons: Googling my symptoms seems to indicate that Gigabyte boards have developed a reputation for the incomplete boot process problem, and there is nothing by way of a solution out there. Rebooting and getting back into windows has become an overnight process for me... let it keep on trying to spin up long enough and it will work.. but not any time within the first hour or two. Comments: Bought 4 of these for new builds at work. 3 of them worked flawlessly. The 4th has given me some problems. If Gigabyte handles this in a professional matter, I will be buying more of these boards! Sometimes you get bad parts, it is not always an indication of how well its made. Comments: Not a bad board considering the price. If you purchase, flash the BIOS asap. Will save you from a load of headaches. Now problems occur very rarely. Comments: Some people say you can use the integrated Intel graphics processor without having a DVI/HDMI out on the motherboard, but who really knows? Plus as noted, the software is probably not bundled with this board. Just a fair warning, my friends.